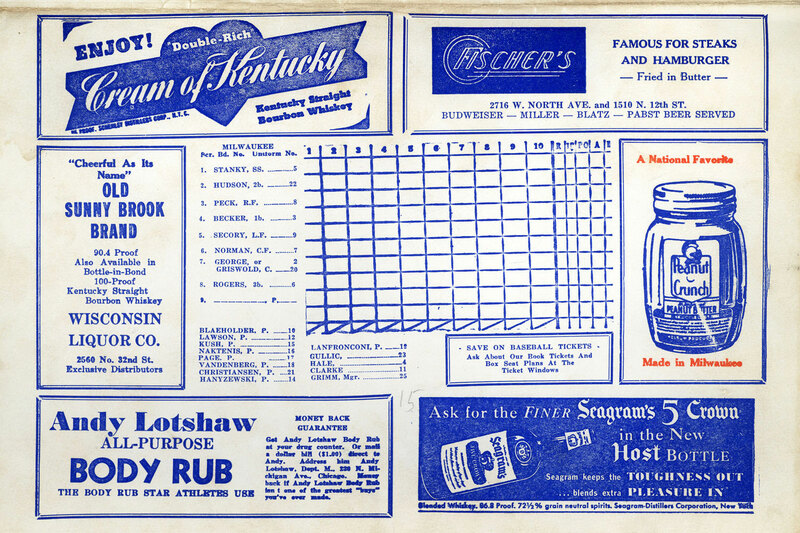 This beautiful 1942 scorecard was sold at Borchert Field. Because you can't tell the players apart without a scorecard! It would have set the patron back a nickel, same as they had for nearly thirty years. The card is one long sheet of heavy stock, folded three times to create a 7 x 10.5 inch booklet. On the cover, Owgust runs the baseline. 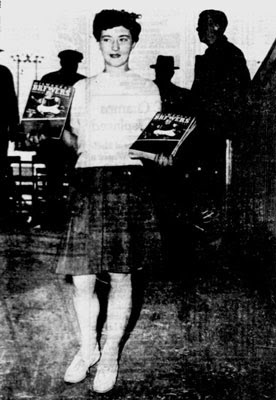 This might have been the first introduction of the Brews' longtime mascot. 1942 was also the year that the same "running Owgust" logo was added to the dugout jackets as part of a uniform overhaul in new owner Bill Veeck's first full season in charge. Does that mean Sport Shirt Bill was responsible for his creation? 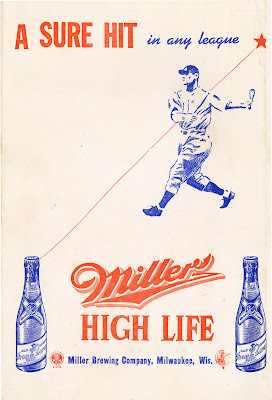 It wouldn't be surprising; Veeck was a promotional genius, and having a mascot logo gave the Brews an endless variety of visual hooks for team materials and special events. Below Owgust, an ad for Clark's Super Gas. Clark's was a longtime supporter of the Brewers, who proudly displayed the gas station's orange and white logo on their covers through the fifties. The scorecard is chock-a-block with local ads. And, of course, Milwaukee baseball just wouldn't be complete without Miller. There were also promotions for fans, including this one where you can help your favorite Brewer win a "handsome Traveling Bag", courtesy of National Trunk Store on the corner of East Wisconsin Avenue and Water Street. 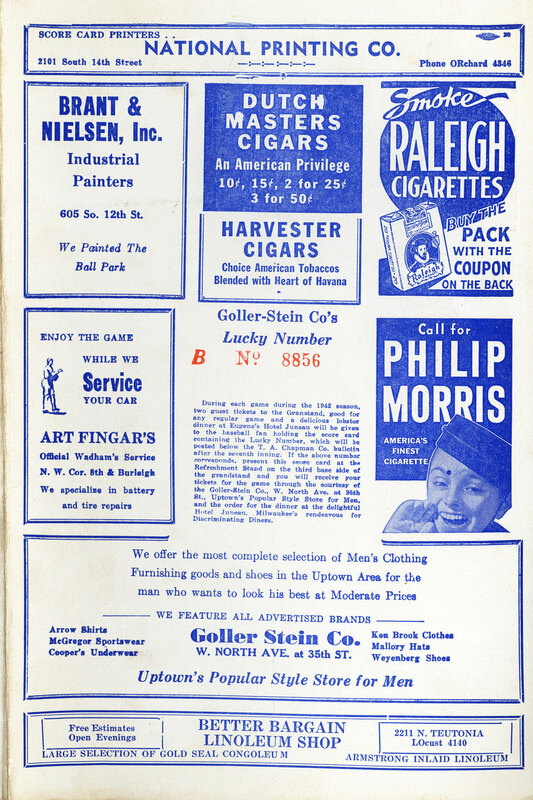 There's a blast from the past; not only an ad for Gimbels, but buying baseball tickets at the department store's cigar counter. And finally, Ladies and Gentlemen, Your Milwaukee Brewers! Interesting - this lists Charlie Grimm as wearing #25. I've seen him more often listed as #30. 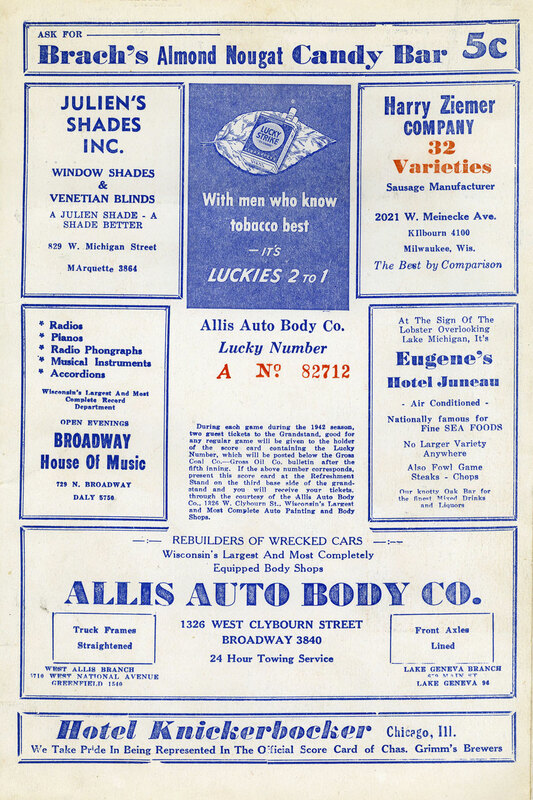 The last two pages feature a pair of ballpark "Lucky Number" promotions. 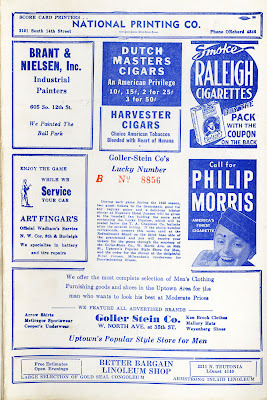 The first was sponsored by the Goller-Stein Company. 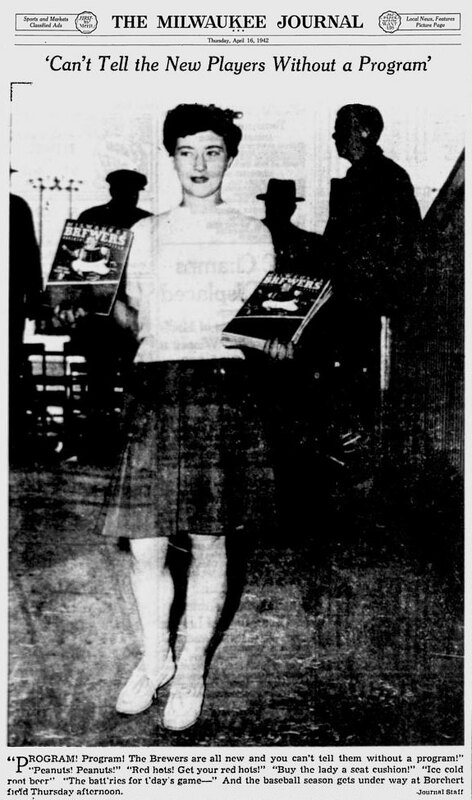 During each game during the 1942 season, two guest tickets to the Grandstand, good for any regular game and a delicious lobster dinner at Eugene's Hotel Juneau will be given to the baseball fan holding the score card containing the Lucky Number, which will be posted below the T.A Chapman Co. bulletin after the seventh inning. If the above number corresponds, present this score card at the Refreshment Stand on the third base side of the grandstand and you will receive your tickets for the game through the courtesy of the Goller-Stein Co., W. North Ave at 35th St., Uptown's Popular Style Store for Men, and the order for the dinner at the delightful Jotel Juneau, Milwaukee's rendezvous for Discriminating Diners. 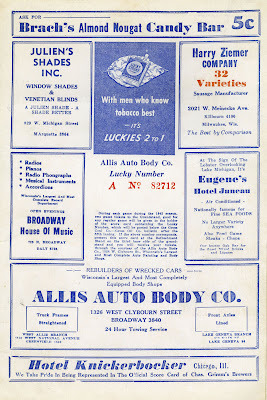 The Allis Auto Body Co. sponsored a similar contest in the fifth inning, but without the lobster dinner. 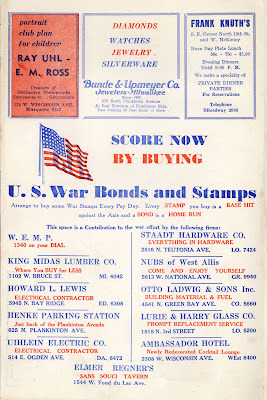 During each game during the 1942 season, two guest tickets to the Grandstand, good for any regular game will be given to the holder of the scorecard containing the Lucky Number, which will be posted below the Gross Coal Co.—Gross Oil Co. bulletin after the fifth inning. 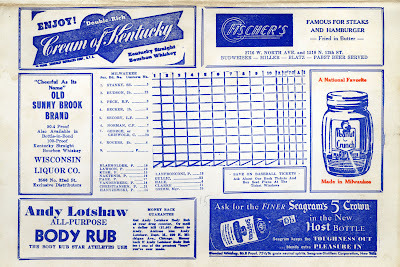 If the above number corresponds, present this score card at the Refreshment Stand on the third base side of the grandstand and you will receive your tickets, through the courtesy of the Allis Auto Body Co., 1326 W. Clybourn St., Wisconsin's Largest and Most Complete Auto Painting and Body Shops. 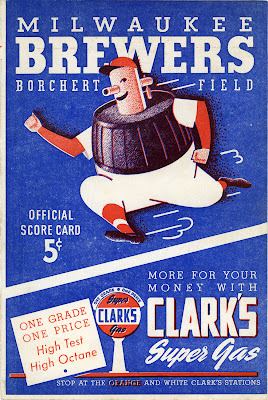 This was the last season that the Brewers published the folded-sheet scorecards. 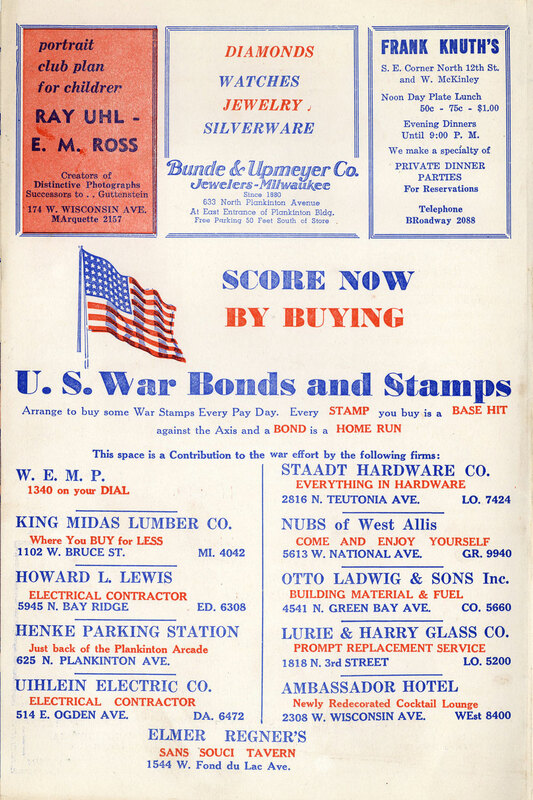 Starting with 1943, the Borchert Field vendors sold magazine-style programs, with a glossy cover and newsprint pages. 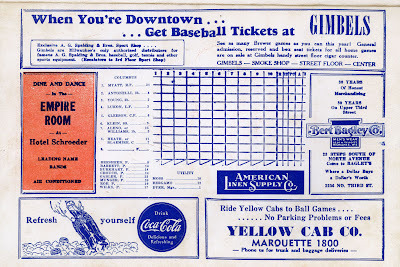 I can picture the vendors walking up and down the aisles of the Orchard in the summer of 1942, collecting nickels and passing out scorecards just like this one to eager Milwaukee fans. "Program! Program! 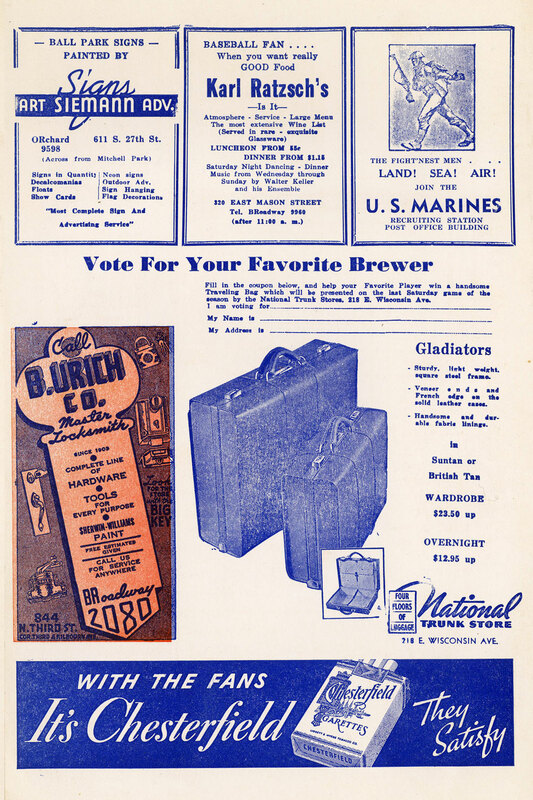 The Brewers are all new and you can't tell them without a program!" "Peanuts! Peanuts!" "Red hots! Get your red hots!" "Buy the lady a seat cushion!" "Ice cold root beer" "The batt'ries for t'day's game—" And the baseball gets under way at Borchert field Thursday afternoon.